I do not like going to movie theaters. I have multiple reasons for that but three main ones are: the length of modern films (who can sit straight through three hours of anything??! ), not numbered seats (which for me adds anxiety and at least 30 minutes to an already insane time at cinema) and popcorn smell (I hate it). For most new releases I wait for a DVD to watch in the comfort of my home with food (and smells!) of my choice. But some movies are just made to be watched in theaters. Titanic, for instance. Ok, I’m joking – I haven’t seen this one in a theater or otherwise. But once a year I find a movie that I want to experience on a big screen. For three years Lord of the Rings films were my once-per-year cinema fix. But after the last chapter was over it was hard to find a suitable candidate. After some considerations the choice was made: Shrek 2. I wasn’t a huge fan of the first movie and the only reason for seeing the sequel that I can remember was that there were going to be two of my favorite singers – Tom Waits and Nick Cave. The first time Puss in Boots put on his doe-eyed expression the theater went “Awwww…” and I could swear I heard not only women’s and children’s voices there. That was the moment when I fell in love with that adorable deceitfully innocent gaze. I became obsessed – not even with the character himself but with that particular video frame. Once I found it (it took some time for people to steal it in a good quality and share with the World), this cuteness overload epitome literally stayed in my day-to-day life for years: I used this picture as a wallpaper on two (consecutive) laptops and two (once again, consecutive) smartphones. *I do not recall a similar exclamation or sentiment itself in my native language/culture. This entry was posted in "Four legs good". Bookmark the permalink. 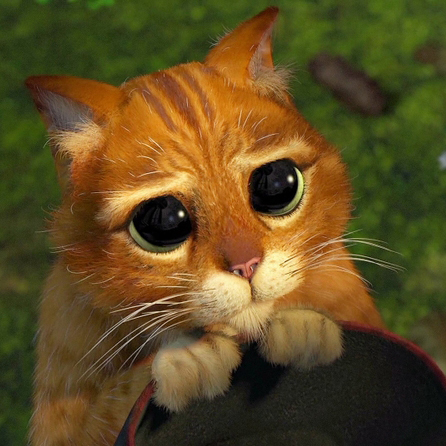 I have not seen this movie, or an image of this character before, but I also said “awwww” when I saw it. I believe there is some study which has found that the size of eyes relative to head is what determines the cuteness factor – of course related to instinct to protect babies. If that is the case, it’s understandable why Puss in Boots is cute overload. Are you planning to share what you replaced him with on your desktop? I was wondering the same thing. What replaced him? I’m surprised you managed to miss the image: for a while it was everywhere! People kept using it as their avatars in forums and blogs. I love those big innocent eyes too! Could see all the scenes Puss in Boots does them over and over. Yep. Even when I know what is coming in the next second on the screen it still works on me. Interesting that you say orange cats in the US – they are typically known as ginger over here. And I wish I had one! After writing this post and then reading your comment I went and changed my desktop from the impersonal standard dark blue to Puss in Boots. I’ll let it live on this computer for a while. First I cracked up to read that one of the reasons you don’t like to go to the movies is the absence of numbered seats! Then I had a moment of surprise when you said that Tom Waits and Nick Cave were your favorite singers (I don’t know why, but for some reason, you loving the gritty voice of Tom Waits really surprised me). And then I got down to your cat face and read of his “deceptive cuteness” and said awwww! You’re the kittenest of kittens, Undina. I love the way you very simply and elegantly reveal yourself through these posts. When I was growing up in movie theaters seats were always numbered so when buying tickets you could choose the best seats out of those that were still available. Better seats were slightly more expensive so it also was a choice. For less popular time slots/movies one could buy a cheaper seat ticket and then move to a better one if itwasn’t taken. But theonly line you had to stand in was a line to buy tickets. After that you could do whatever you wanted until the movie starts – your seats were guaranteed. I really dislike that “get the best possible seat you can” game. That’s why I never fly those airlines where you don’t get your seat inadvance. As to those two singers… I’m surprised myself since, in general, I’m not a big music fan: I can go for weeks without listening to a single music accord but I have a very limited set of singers/groups/musicians whom I consider my favorites. Waits (to the bigger extend) and Cave (his Murder Ballads mostly) are two of those few. The movie theater closest to where I live now offers numbered seats AND offers movie-goers a full menu for lunch or dinner. I think this is the most disgusting concept ever because people are sloppy and who the h-ll wants to sit next to that, hear people chewing and the worst of it all — the smell of mostly fried foods. Haha- I agree with Suzanne- you are adorable! (as is Puss in Boots)..Also I love that you love Tom Waits..:) I have this bad habit – when I love a song by an artist- I listen to only that song for the longest time without listening to more (because none of the other songs seem to compare with my original favorite..). That happened to me with Tom Waits a few years ago- I was obsessed with the song “Martha” (still LOVE it- was listening to it as I started typing this comment). It took me so long to listen to some of his other stuff- but still only Martha sticks..:). What are some of your favorites? If I had to recommend just one piece – it would be Russian Dance (if you haven’t heard it before – don’t expect any words ;) ): I think it’s a perfect stylization. Other songs I like: I’ll Be Gone, Cemetery Polka, Starving In The Belly Of The Whale, Tango Till They’re Sore and God’s Away on Business. Puss in Boots! That’s a blast from the past. Shhhhhh, Rusty has some SERIOUS competition! Sometimes Rusty’s eyes are almost as big as PiB’s on this picture. Though usually it happens when Rusty is in a crazy/hunting mood. I love an orange cat! When I was a child, I wanted a cat so bad! My best friend had a huge orange cat named George, who allowed us to dress him up and play with him as a doll. I adored that cat! He was the color of a new penny, green eyes and all! PS – I’m a huge Nick Cave fan too! I love his voice – haunting, but sometimes almost classic crooner a la Sinatra! Maybe it’s just me. Looking back at my childhood I feel bad about all the cats I abused used as dolls/circus acrobats/doctor’s patients… ;) But since then I’m trying to make up for it. I remeber being really proud of myself when I recognized Cave’s voice in a completely unknown to me song I heard in Starbucks. Great pic. Too bad his solo film isn’t so great, but maybe that’s just me. I have a fondness for the Shrek films partly because they usually feature my own favourite band – Eels. Whoever is in charge of the music selection does a great job. Garfield will always have the top spot in my heart but here’s to all orange cats! I agree about the music selection – love most of the songs in the movie. Garfield is still one of my favorite cats. I’m not sure if you remeber, but Puss in Boots in one of the scenes says the famous Garfield’s: I hate Mondays. Ha! I didn’t know that. Too cute. Undina, I have been vacationing and am catching up on blogs. I just wanted to stop by to say that I agree with you about seating at movies. I was so pleased to learn recently that a movie theatre chain in my town has introduced assigned seating. You can see your seats online before you. It’s brand new and I’m excited to try this. Previously at this theatre chain (which is local and very popular in Austin) I would often struggle to find a seat beside my companion(s). Anyway. More theatres should do this.